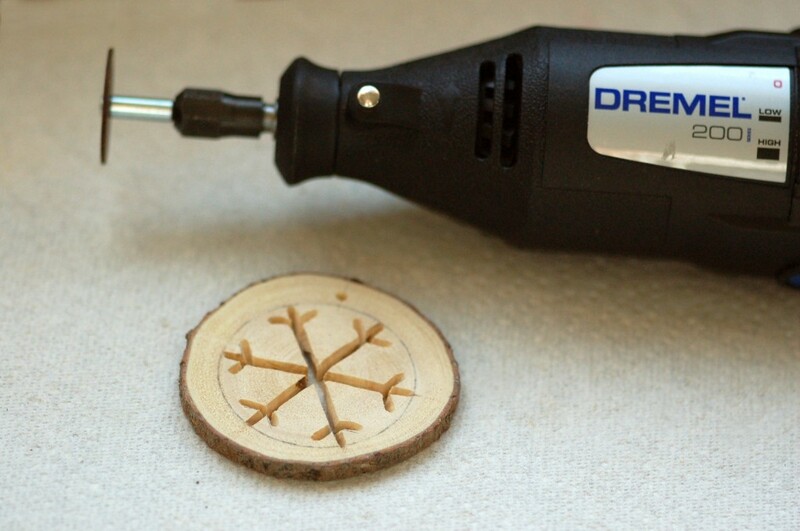 This year I got a Dremel for Christmas from Jennifer’s Aunt Gail. 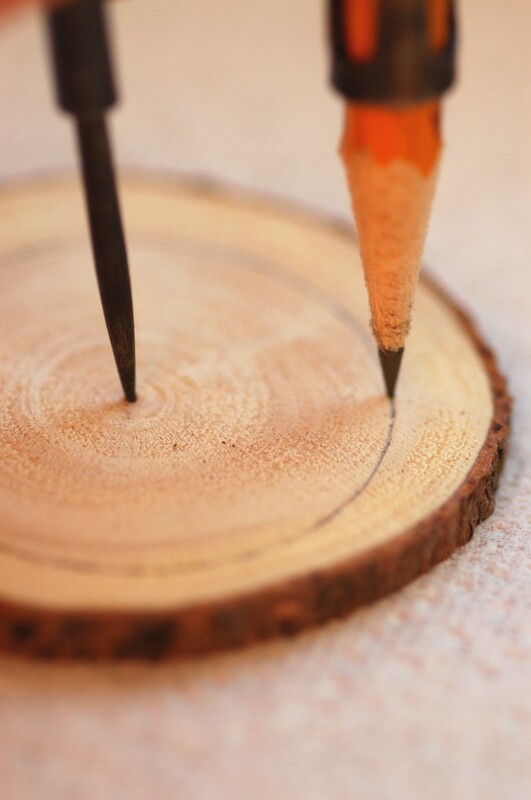 I was excited to try it out and thought that a wood-working craft would be a good first project, since I had some previous experience and the supplies on hand. 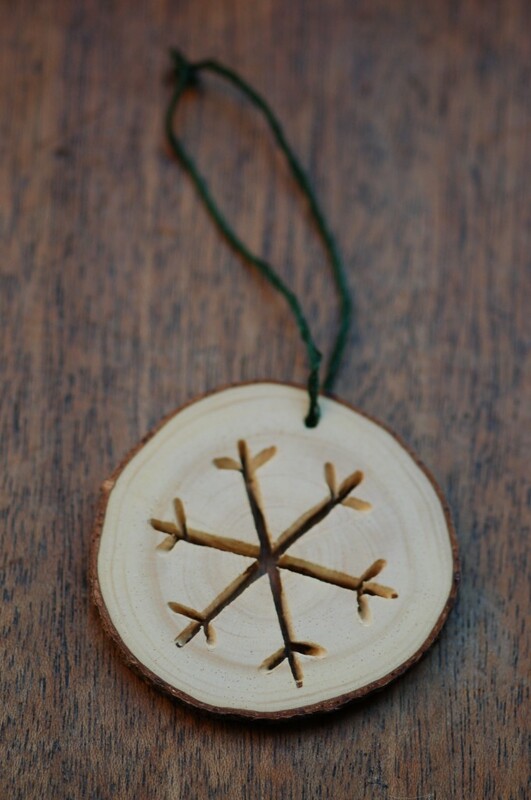 A snowflake thank-you ornament seemed perfect, considering the season and the white Christmas we had last month. (Actually we only had a white Christmas morning, since we flew from St. Louis to LA on Christmas Day.) And though a snowflake project seems like an unusual way to welcome February, the blizzard conditions across the country make it oddly appropriate! Since I’ve been into log slice projects, I began by cutting a thin slice from an old log (the trunk of last year’s Christmas tree). 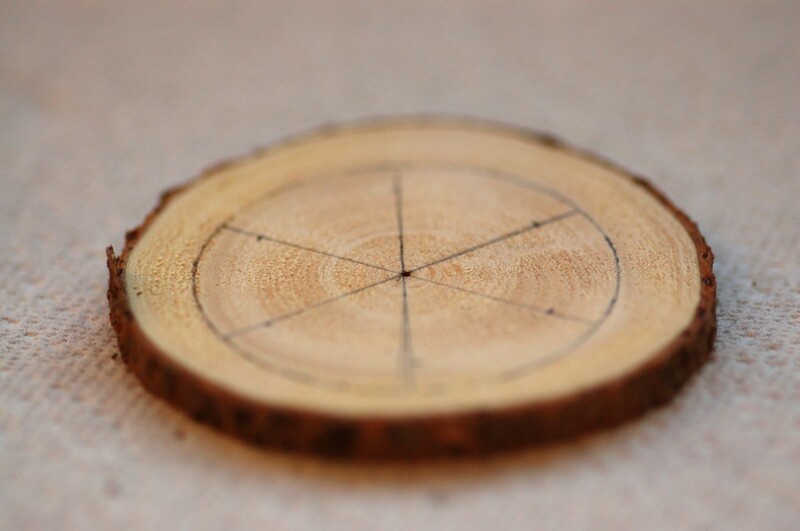 Then I drew a circle on the log slice using a compass centered at the center of the grain. Using a protractor, I drew three lines across the circle, dividing it into six equal sections and marked a spot on each end of the line for adding branches to the arms of the snowflake. 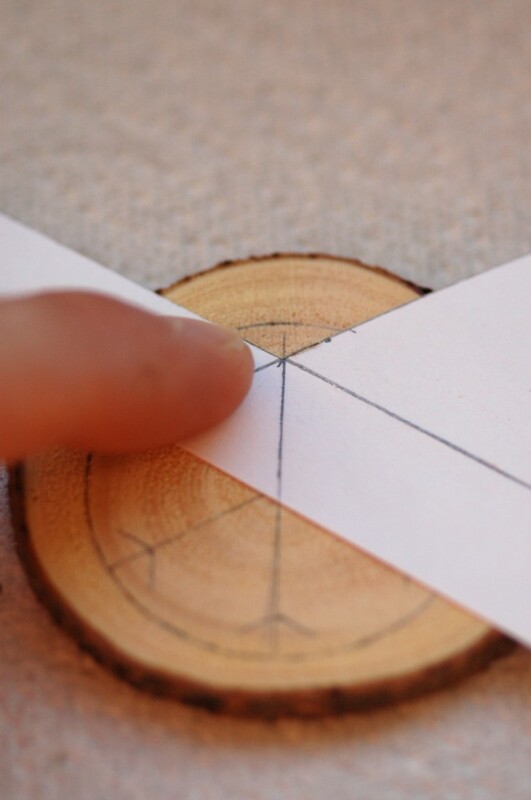 Again using the protractor, I cut a 120-degree angle out of scrap paper for tracing branches off the snowflake arms. Next I cut out the snowflake using the Dremel with two of the wood-cutting attachments and drilled a small hole to hang it from. How do you cut the trunk slice so thin??? Hi Gene, I used a chop saw to cut thin slices of the trunk. A skill saw would probably also work, though it wouldn’t as quick or easy as the chop saw. I hope that’s helpful! 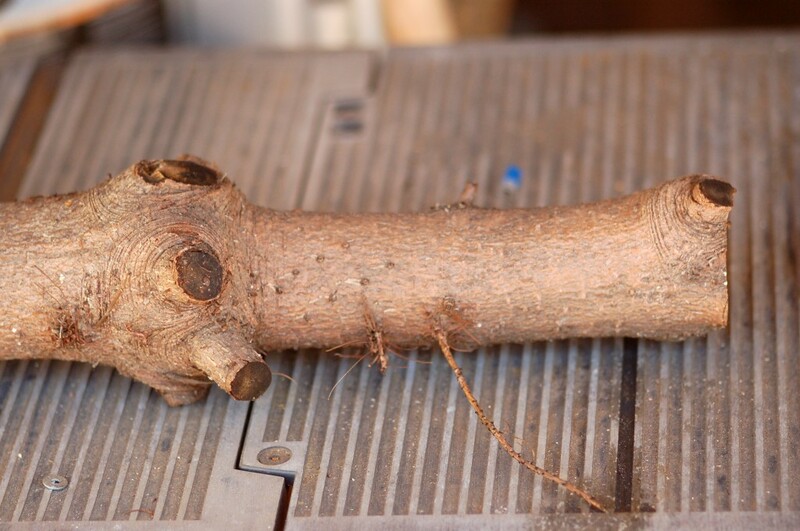 You mentioned that you used two of the wood cutting attachments, could you tell us what they are? I have had a hard time with the disk cutters as even the smallest disk is too big to cut the small lines around the outside of the design, while still being able to cut the whole way through the wood. I’m curious of the 2 bits you used as well? What Dremel bits did you use. 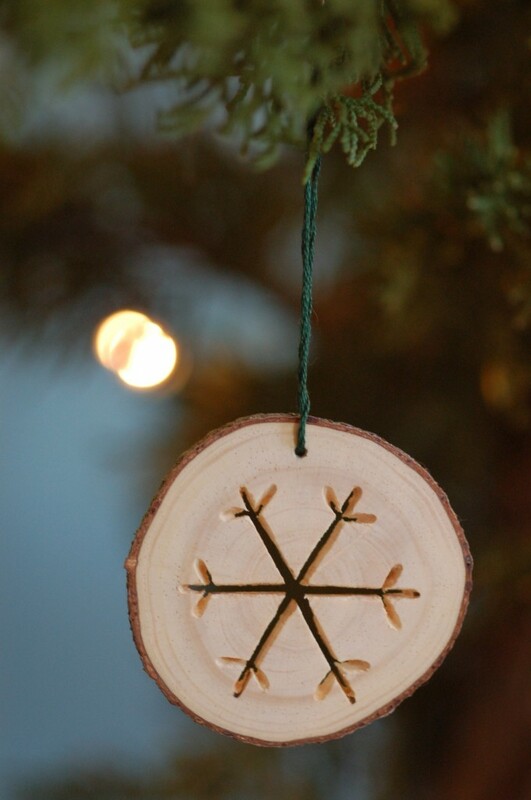 Great Little project with natural materials, will give this a go for the xmas tree.